Creating art is the perfect way to connect with ideas that a person holds dear. It allows one to explore and contemplate their feelings about a subject; especially those we feel are Holy to us. Santa Fe Art Classes will honor Easter and Santuario De Chimayo with a special Paint Moment workshop on Good Friday, March 25th from 2-4 PM. Visitors will take home a memento of Northern New Mexico by embarking on a creative pilgrimage rather than a physical one. Santa Fe Art Classes creates a perfect homage to the sacred space the church holds in the hearts of many. The Santuario De Chimayo is a sacred place to many New Mexicans. The devout make pilgrimages from across the state every Good Friday to pray, and to collect a sample of the holy dirt that the shrine is said to house. Legend holds that the soil has the ability to cure ailments, and there are many tales of crutches and other medical implements being left at the church after a visit. 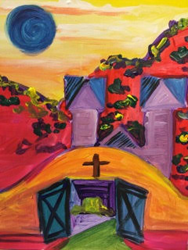 Attendees will each create their own interpretation of the holy church in a 2-hour, beginner, guided painting class. Using an original source painting as a starting point, they will learn to paint the chapel in a way that reflects their own understanding of the place. Browse upcoming workshops, schedule a private session, and learn more at http://santafeartclasses.com/ or by calling (575) 404-1801. Robbi Firestone created Santa Fe Art Classes to inspire and empower people to unleash freedom through creativity. Firestone is a fine artist, and when not teaching, is currently creating an installation piece titled The Empty Womb, which examines the dark shadows of femininity: infertility. It balances the cult of woman as creator while investigating shadows, strengths and biological lineage by using medical paraphernalia from Firestone’s personal In Vitro-journey with traditional womens work (crochet, knitting, lullabies). It is on view while being constructed at her gallery. Firestone also paints oil portrait commissions including subjects; authors Michael Beckwith of bestselling book and film, The Secret, and Don Miguel Ruiz, author of The Four Agreements, Bart Millard of best-selling band MercyMe, and 4-time Grammy Winner, Keb'Mo. Learn more about Robbi Firestone's work at http://www.RobbiFirestone.com.